A saber-toothed squirrel (known as Scrat) is trying to find a place to store his prized acorn. Eventually, as he tries to stomp it into the ground, he causes a large crack in the ground that extends for miles and miles and sets off a large avalanche. He barely escapes, but finds himself stepped on by a herd of prehistoric animals. The animals are trying to avoid the ice age by migrating south. Sid, a clumsy ground sloth left behind by his family, decides to move on by himself but is attacked by two Brontops whom he angered by ruining their meal. 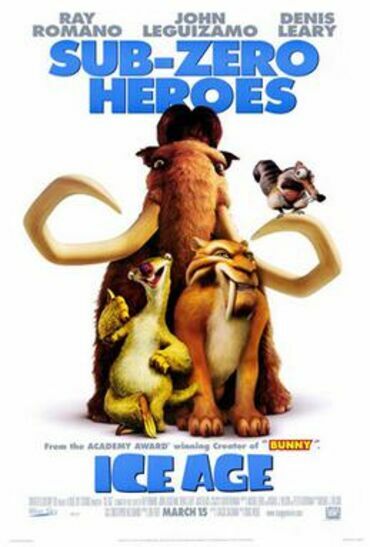 Sid is soon saved by Manfred ("Manny"), an agitated mammoth who fights them off and is heading north. Not wanting to be alone and unprotected, Sid follows Manny. Meanwhile, Soto, the leader of a Smilodon pack, wants revenge on a group of humans for killing half of his pack, by eating the chief's baby son, Roshan, alive. Soto leads a raid on the human camp, during which Roshan's mother is separated from the rest and jumps down a waterfall when cornered by Soto's lieutenant, Diego. For his failure, Diego is sent to find and retrieve the baby. Read more on Wikipedia.